There are few more popular state parks in Pennsylvania than Ricketts Glen State Park. 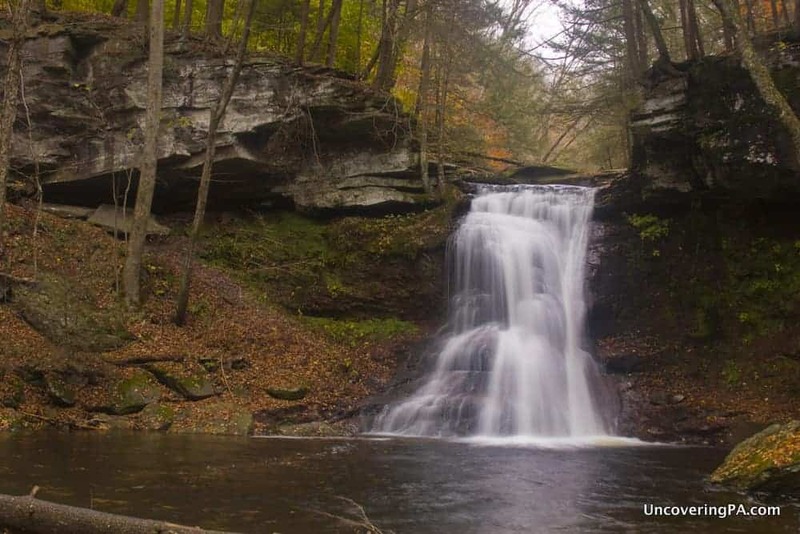 Located in Northeastern Pennsylvania, the park is known for its 21 named waterfalls along the 7.2-mile Falls Trail. 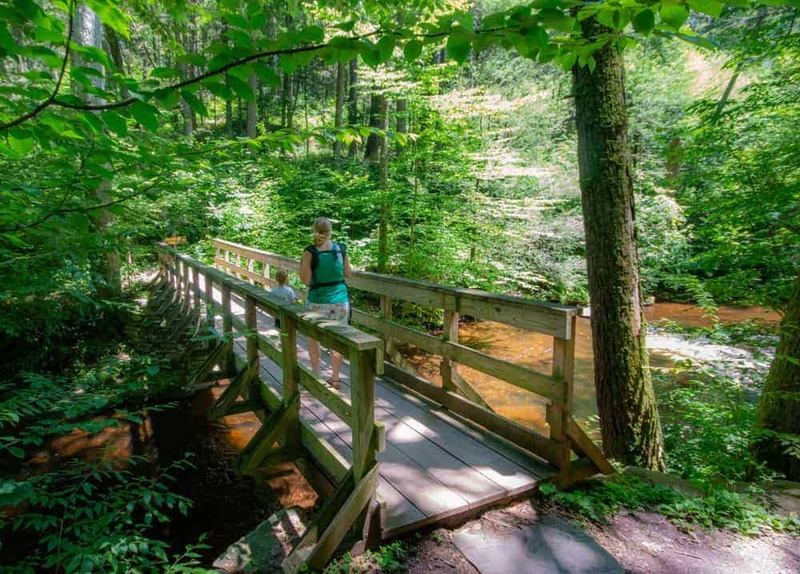 If you are planning to visit, camping at Ricketts Glen State Park is a great way to make sure you are close to the trails and can fully explore the park. 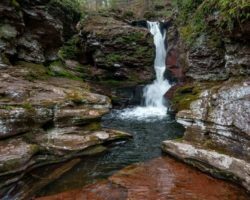 Whether you are exploring the Falls Trail, the other trails in the park, the beach area, or using it as a base for exploring northeastern Pennsylvania, camping at Ricketts Glen State Park is a great choice. Check out our top tips for staying in this great campground. 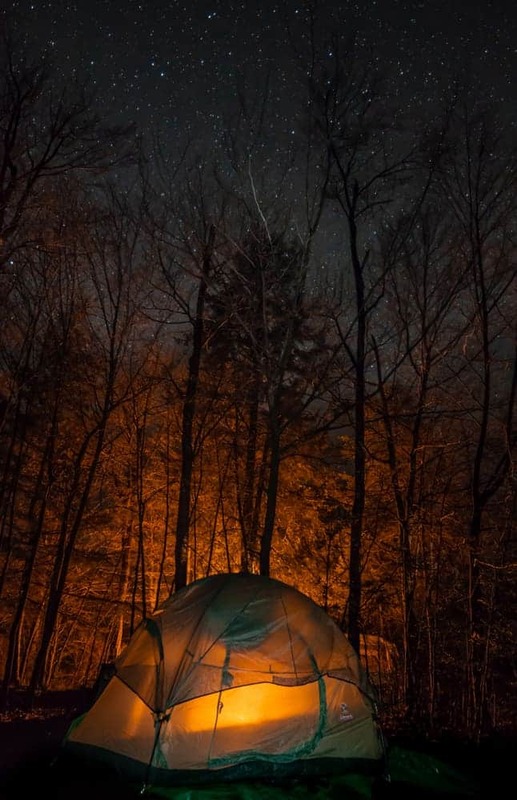 Camping at Ricketts Glen State Park is a great experience. The campground at Ricketts Glen State Park is divided into two sections: The Big Loop and the Small Loop. All told there are 120 camp sites, most of which can accommodate either a tent or a trailer. Spots in the campground are almost all at least partial shady, so you aren’t likely to get a ton of sun first thing in the morning. The exception is the spots the road into the Small Loop, some of which lacked much shade. As a whole, the campground is a pretty tight fit, and you aren’t going to be far from your neighbors. However, during my visits, most campers have been respectful of quiet hours and there hasn’t been an issue. The Beach Trail offers easy access between the campground loops and the park’s beach. Of the two loops, the Big Loop is not only bigger, but also seems a bit nicer to me. The sites here are a bit more spaced out and most of the campsites on the outside of the loop have direct lake access for fishing or launching kayaks. 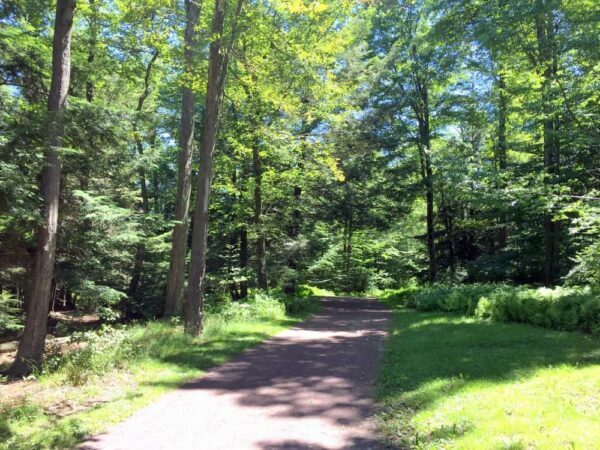 On the other hand, if you are going camping with a dog at Ricketts Glen, you will need to book a site in the Small Loop as that’s the only area that accepts dogs. Each loop has a bathhouse that contains flushing toilets, sinks, and showers. There are also large sinks behind the bathhouse which are perfect for laundry, dishes, or just filling water bottles. Each loop has a bathhouse with hot water, showers, and flushing toilets. 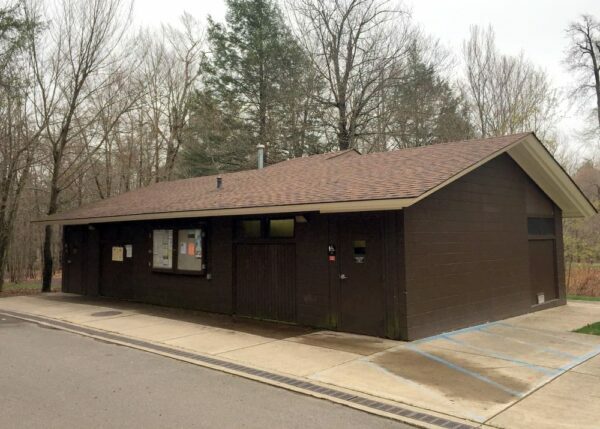 The bathrooms are cleaned twice daily and are reasonably clean for campground bathrooms. The showers, while somewhat small, provide good water pressure and hot water. Even on a weekend when the campground was full, the bathrooms seemed plenty large to accommodate everyone without too much waiting. In addition to campsites, the park has 15 cabins. The five deluxe cottages are located in a lakefront area along the Big Loop and do not have bathrooms inside. The 10 modern cabins are located away from the other overnight options and do have bathrooms, but are not close to the water. A map of the campground at Ricketts Glen State Park can be found here. 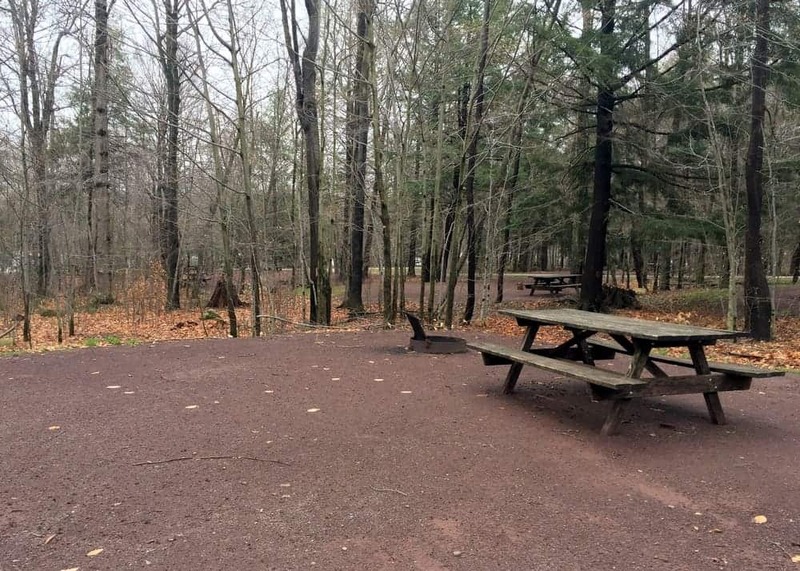 What is each campsite like at Ricketts Glen? Campfires are a great way to spend the evening at Ricketts Glen. 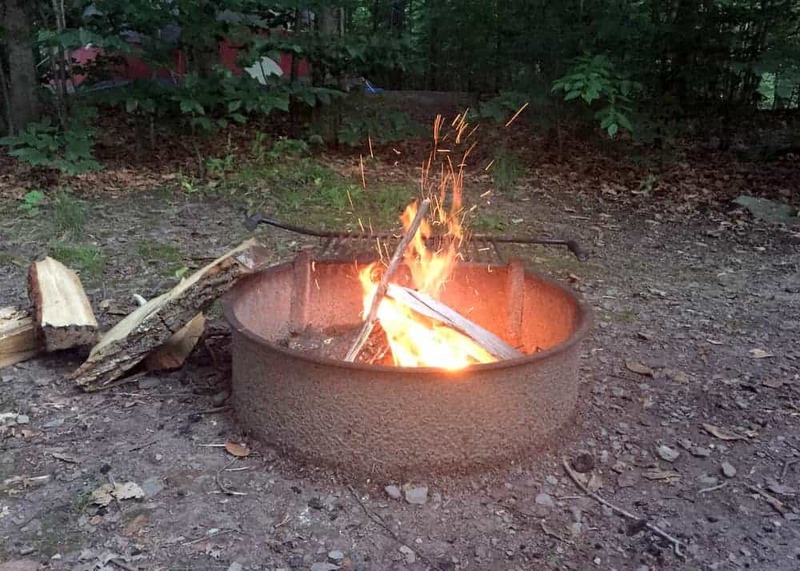 All of the campsites have three basic things: a fire ring, a picnic table, and a relatively flat area for a tent. With one exception, all spots have driveways long enough for campers or trailers. However, while there is room for campers, none of the spots offer electric or water hookups. There is a dumping station, though, near the dumpsters. A campsite at Ricketts Glen. Campsites are designed to hold one vehicle and up to five people. If you have more than one vehicle with you, there is additional parking a short walk from the campsites. Firewood can be purchased at the concession stand at the beach. You will also find places nearby selling firewood. If you opt to get it from outside the park, make sure to purchase it nearby to avoid any issues with non-native bugs. I found the firewood available at Red Rock Corner Store at the bottom of the hill near the intersection of Routes 118 and 487 to be a great deal. 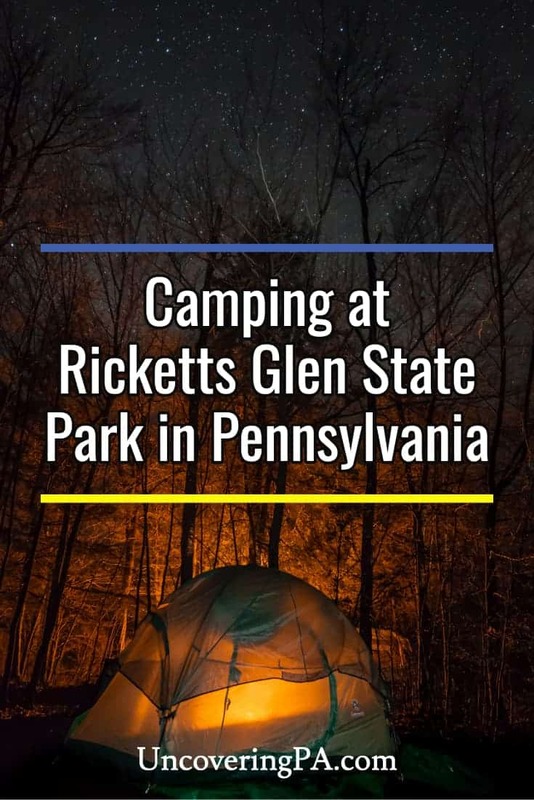 How do I book a spot for camping at Ricketts Glen State Park? Waterfalls abound at Ricketts Glen State Park. 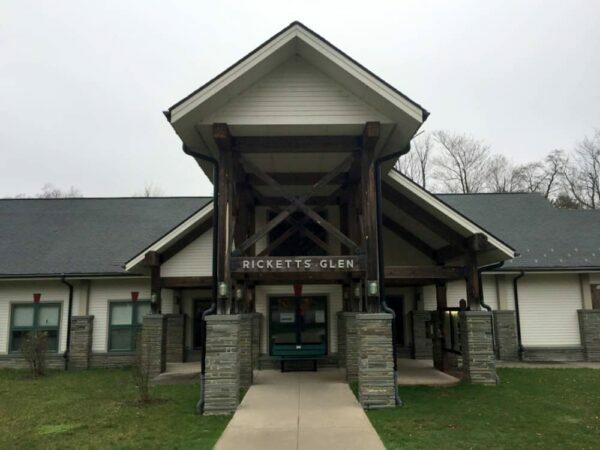 If you want to book a camp site at Ricketts Glen State Park, start by visiting Reserve America, which handles all of the bookings for the campground. Reservations can be made as much as 11 months prior to the date of the booking. Early reservations are especially recommended for the park’s cabins as they fill up very quickly. It’s also worth noting that the Small Loop will be closed starting in early November 2018 through much of 2019. While parts may be open for last-minute bookings, this will roughly halve the number of camping sites available in the park. Early reservations are definitely recommended for 2019. In 2018, campsites cost $19 per night on weekdays and $23 per night on weekends. There is also a $6 booking fee that is charged. Check in at the visitor center before heading to your campsite. While the cabins are open year round, the campground is closed from November through March, roughly the same dates that the Falls Trail is closed each year (though you can still hike it in the winter with proper equipment). When you arrive at the park, go to the visitor center near the upper entrance to check in to your camping spot. If you arrive after hours, they put the information you need next to the entrance to the building. 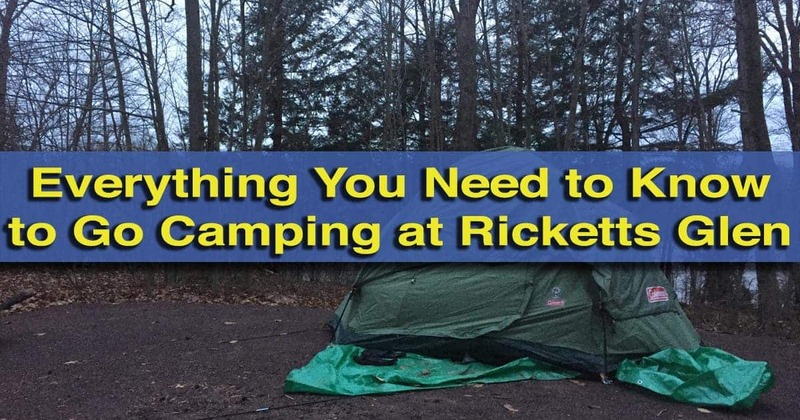 If you’ve not reserved a spot to camp at Ricketts Glen, the information here will also tell you if there are any spots available on a first-come, first-served basis. Check in time and check out time for the campsites is 3pm. If you arrive before then, you may have to wait before you can set up camp. I personally love the late check out time, as I can get an early start on my hiking, and then come back in the afternoon, take a quick nap, and then tear down my camp. 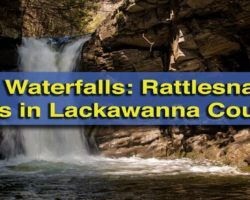 What is there to do at Ricketts Glen State Park? 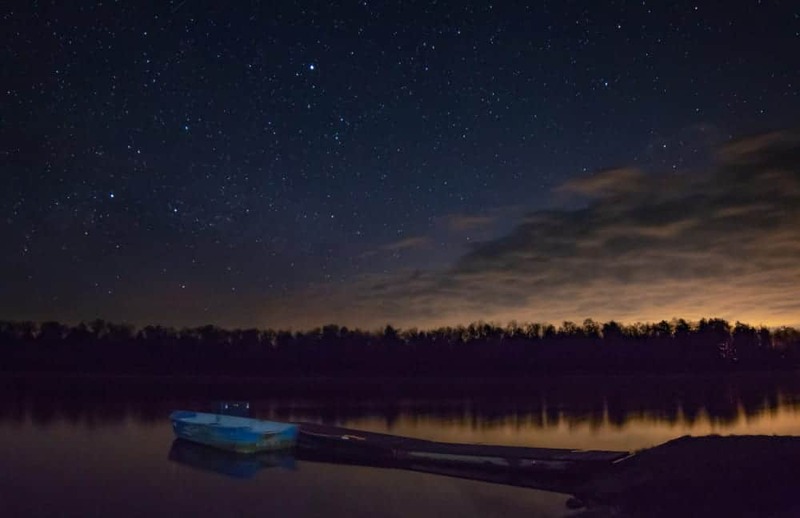 Don’t miss the incredible nighttime skies at Ricketts Glen. Ricketts Glen is known primarily for one thing: the 20+ waterfalls along its Falls Trail. However, while no visit to the park is complete without hiking this amazing trail, there are a lot more great things to do in the park. Lake Jean is a 245-acre lake that is located above the Falls Trail (the Ganoga Glen side is the outlet for this lake). This lake is great for boating, and the park rents kayaks and other small watercraft during the summer months. From both boats and the shore, fishing is popular at the lake. 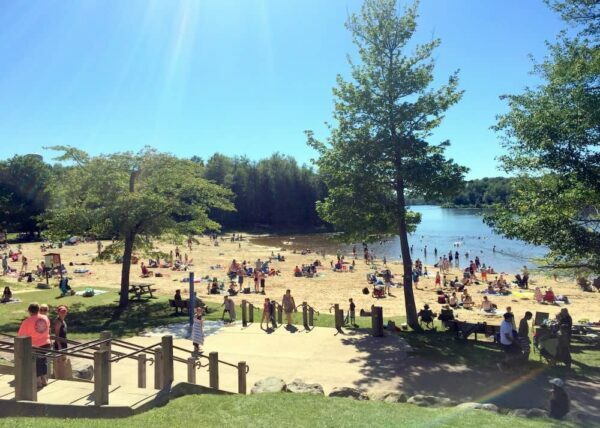 The beach on Lake Jean is a popular summertime activity in the park. Lake Jean also features a very large beach and a nice swimming area. The beach area can be reached from both campground loops via the Beach Trail, a wide and flat trail that can accommodate both bikes and strollers. This unguarded beach is open from Memorial Day to Labor Day and a perfect place to cool off after hiking in the park. During the summer, a concession stand (cash only) offers reasonably priced food and snacks. In addition to the aforementioned Falls Trail, the park is home to 19 other miles of hiking trails. Two great choices are the two-mile Grand View Trail (which features nice views of the valley) and the one-mile Evergreen Trail (which features the spectacular Adams Falls and some nice old-growth forest). The Evergreen Trail is a beautiful loop that includes an amazing waterfall and an old-growth forest. 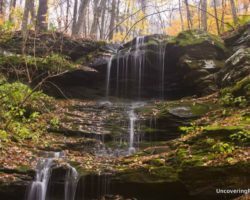 If you are looking for other things to do outside of the park, nearby State Game Lands 13 features the easy-to-reach Sullivan Falls, as well as many harder-to-reach falls. 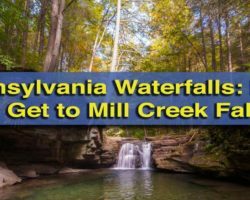 Ricketts Glen State Park is also a short drive from the fantastic Worlds End State Park, which has even more great hiking and waterfalls, and the popular Knoebels Amusement Park. 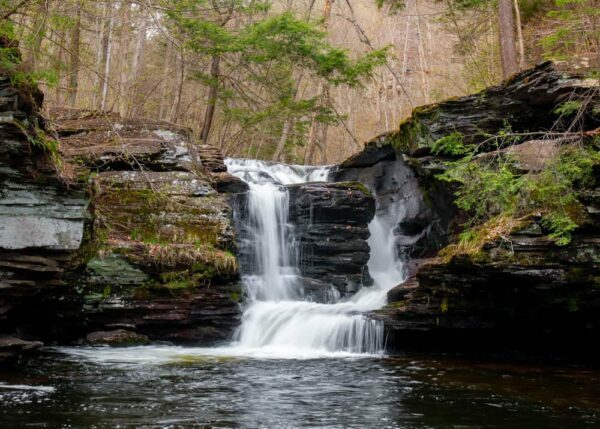 Sullivan Falls is one of many beautiful waterfalls near Ricketts Glen State Park. 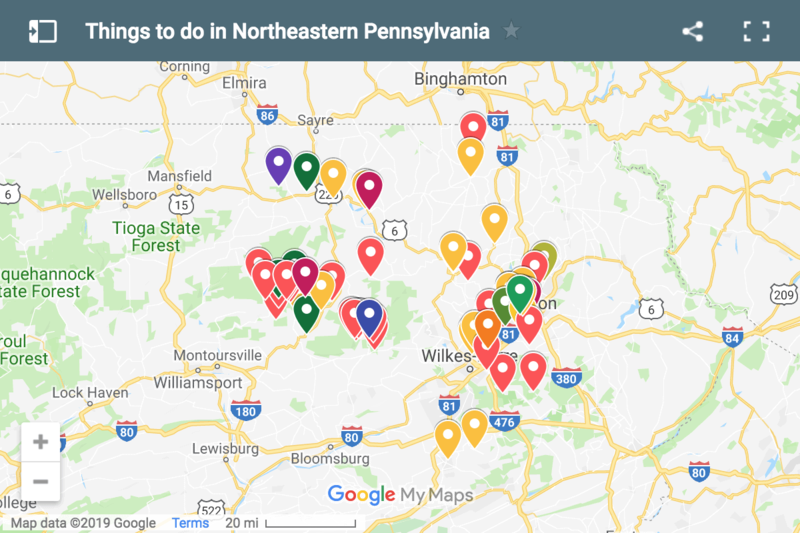 If you are looking for indoor things to do near Ricketts Glen State Park, check out the Eagles Mere Air and Auto Museums, Steamtown National Historic Site, and the Wyoming County Historical Society Museum. Is there electric in the bathrooms for a hair dryer or no? I just have to blow dry my hair. I did see electrical outlets in the bathroom. I didn’t try them but would assume they work. If it’s a major concern, I’d call the park office to check. How far is it from Rt 118 parking lot to the bottom of Ganoga Falls. I’d guess about 3/4 of a mile, but I don’t know for sure. Thanks Jim. We can’t do the steps in the Glen but thought I could at least walk to the bottom of Ganoga Falls and go back the same way. There are some steps and a few steep parts to get to the bottom of Ganoga Falls. If you can handle the distance, a 3ish mile round trip from the Route 118 lot to the first three falls and back might be easier.